Exanthem is a type of rash that is typically viral in nature and brings out systemic symptoms like malaise, headache and fever. In some cases, the symptoms of viral exanthem will be secondary, following a reaction to a toxin or damage produced by an organism or simply an immune response. In most cases, the rash will go away by itself, but it may last at least several days or over a month. To better understand viral exanthem contagious feature, keep reading so you willbe prepared if your child develops this rash. Exanthem is a type of widespread rash that typically affects children. It can be caused by an autoimmune disease, microorganisms, drugs or toxins. There are historically six types of infectious childhood exanthems, and four of these are viral. Because the four viral exanthems are very similar, they are frequently studied together. The term "first disease" is used to describe measles, also known as rubeola. "Third disease" refers to German measles or rubella. "Fifth disease" is the term for erythema infectiosum and "sixth disease" is roseola infantum. The numbers were assigned to the illnesses in 1905. The rest two are bacteria related. "Second disease" or scarlet fever is typically linked to the bacterium Streptococcus pyogenes. "Fourth disease" is still not widely accepted and is possibly related to the bacterium known as Staphylococcus aureus. 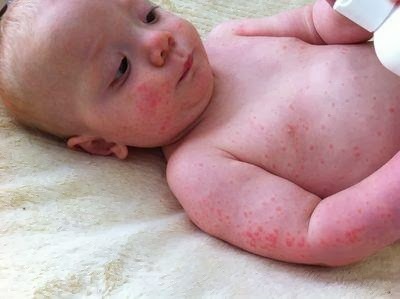 Rubeola is also sometimes known as 10-day measles, measles, or red measles and this viral exanthema is a contagious infection and can lead to a distinct rash. It typically spreads via direct contact with the discharge from the throat or nose, or through airborne droplets of an infected child. This is highly infectious and usually includes a cough, fever and rash. Prevention: The rubeola vaccine has decreased the incidence of rubeola by around 99% and nowadays around 5% of measles are due to vaccine failure. If your child was exposed and not immunized, he can still receive the vaccine within a 72 hour window to help prevent the condition. You can also prevent its spread by making sure that anyone your sick child comes in contact with has received the immunization and that he doesn't attend daycare or school for four days after the appearance of the rash. Treatment: There isn't a cure for rubeola because it is caused by a virus. Instead, treatment aims to prevent the disease at first and decrease symptom once your kids gets it. This means that you should give your children acetaminophen (NEVER aspirin) for the fever and increase their fluid intake. Rubella is spread via direct contact with the discharge from the throat or nose and most children or infants who catch it will just have a mild rash. It is possible, however, for children to contract rubella from their mother while in the womb, in which case there is a risk of severe birth defects or miscarriage. As such, pregnant women who come in contact with rubella should see their doctor immediately. Prevention: The vaccine has decreased the rate of rubella by over 99% and today it mostly affects unvaccinated adults. The vaccine is typically given with the mumps and measles vaccine and known as the MMR vaccine. It is usually given at 12 or 15 months and again at 4 to 6 years. You can also prevent the spread of the condition by making sure that everyone who comes in contact with the sick person is immunized and that he doesn't go to school or work until seven days after his rash appears. If a child is born with rubella, he is contagious for a year. Treatment: Treating rubella involves helping to prevent the condition or to relieve the symptoms. As a viral exanthem, there isn't a cure, but rest and increased fluid intake will provide relief. Fifth disease, caused by human parvovirus, is moderately contagious and viral, causing a rash without fever. Like the other types of viral exanthem, it is spread by direct contact with nasal or throat discharge or infected blood. It is more common in the spring and winter, particularly among those between age 5 and 14. Outbreaks are more frequent in school settings. Treatment: If you are pregnant and exposed to fifth disease, you should seek immediate treatment. Most of the time, this is a mild illness, but parvovirus B19 infection may lead to acute severe anemia if you have immune deficiencies or sickle-cell disease. It carries a small risk for fetal death during pregnancy.